François-Henri Pinault, a French billionaire and husband of Salma Hayek, is making a very large donation in order to help restore Notre Dame. 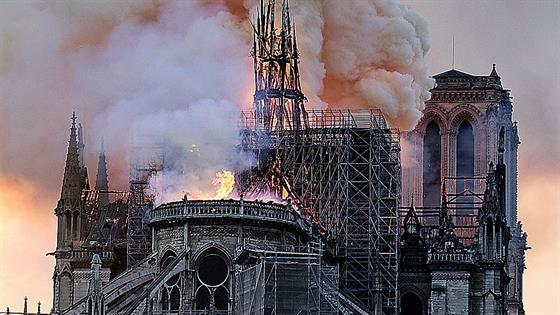 Following Monday's devastating fire, which destroyed parts of the landmark in Paris, Pinault and his father, François Pinault, are pledging €100 million (about $113 million) to help repair the cathedral. "My father and I have decided to release from Artemis funds a sum of 100 million euros to participate in the effort that will be necessary for the complete reconstruction of Notre Dame," Pinault, the CEO of luxury group Kering—which owns brands like Gucci and Balenciaga—said in a statement on Monday evening. Hayek, who shares daughter Valentina with Pinault, took to Instagram to react to the fire on Monday, writing, "As many others I'm in deep shock and sadness to witness the beauty of Notre-Dame turn into smoke. I love you Paris." The Oscar nominee returned to social media on Tuesday to tell her followers, "It's so inspiring to see the strength and spirit of France, unite to rebuild their heritage." Also on Tuesday, Bernard Arnault, the CEO of luxury goods company LVMH, pledged €200 million to help fund the reconstruction of Notre Dame. "In the wake of this national tragedy, the Arnault family and the LVMH Group pledge their support for #NotreDame," a statement on the LVMH Instagram account read Tuesday. "They will donate a total of 200 million euros to the fund for reconstruction of this architectural work, which is an integral part of the history of France."